PROTECT A/S develops and manufactures security fog cannons to protect valuables against theft, vandalism and robbery. When the alarm is activated, the room fills with fog dissuading the burglar from entering. If the burglar is inside the room when the fog is discharged, it is impossible for the burglar to see and locate the valuables. Lately the PROTECT fog cannons have been installed in more than 4,500 banks in Brazil, which has led to a reduction of 90% in number of attacks on ATM’s. PROTECT A/S is based in Denmark and owned by CEO Poul Dalsgaard and Genua A/S. The manufacturing facilities are located in Latvia and Denmark. The company’s R&D, administration, test facilities, and sales, and marketing are located at the headquarters in Aarhus, Denmark. PROTECT is the fastest growing and one of the world’s largest manufacturer of fog cannons. The company has a network of distributors in over 50 countries on five continents. PROTECT Fog Cannon are high-quality, CE marked and approved products that have been tested by some of the world’s leading and independent laboratories and test institutes. We are recommended by police forces and insurance companies across the globe. PROTECT also won several international and national prizes for its products. Computers, flat screens, designer furniture etc. are the burglars latest preferred targets in banks as there is seldom cash to steal. PROTECT security fog system has solved these problems. The fog cannon units are activated the instance a burglary occurs. Within seconds dense fog will be discharged blinding the criminals and attracting attention. Once inside your premises burglars are likely to steal your valuables if you are only protected by a conventional alarm system. PROTECT Fog Cannons will fill the area with dense fog and make it impossible for the criminals to see – and steal anything. Long enough for the police to arrive! The fog is completely harmless, and will not cause damage! ATM facilities are particularly vulnerable when it comes to security. The cash machines are either pulled out by vehicles, or blown open by gas/explosives resulting in theft and damage. Not only does this mean money is stolen, but it causes permanent damage to the cash machine and the building. This of course causes concern to the public. Innocent people living in the building and by coincidence is passing the bank are risking their lives. The only thing that has proved effective against attacks on ATMs is security fog! 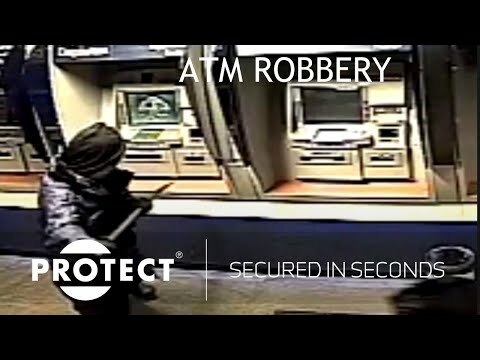 PROTECT specialise in ATM security, and ATM facilities worldwide are protected by our unique security fog system. Fog cannon units save the banks trouble and expenditure. One ATM attack can cost 150.000 Euros, so it is wise to invest in PROTECT security fog. Just one attack could therefore finance many fog cannon installations. Today 10,000 ATM’s are protected by PROTECT Fog Cannons and the number is increasing every month. The weak point in cash handling is in the transference. In specified areas armoured vehicles dock to unload the cash. These areas are often the scene of serious attacks and robberies. PROTECT security fog systems have been installed in many such areas around the world. By remotely activating a fog cannon, the staff can withdraw into the building with the money. PROTECT have even installed security fog inside the vehicles to keep the cargo and the drivers safe. Customers, alarm installers and control centers have two options to get the full overview of the fog cannon installations and the opportunity to track the fog cannons, receive important data and act accordingly. PROTECT IntelliCloud is our own service reporting system. It gives you a full overview of all of your customers' IntelliCloud-enabled fog cannons and their status. From the user-friendly dashboard, you get all the essential information about customer locations, fluid levels, battery levels and technical status. The system constantly monitors the status of each installation. Whenever an installation needs attention, IntelliCloud automatically notifies you by email. The user-friendly IntelliCloud system gives you valuable data, that enables you to troubleshoot remotely. In most cases, this means that you only have to visit the customer once to solve the problem, thus saving you valuable time and money. IntelliCloud gives you the tools to provide personalized customer service while the customers can sleep well at night, knowing that their installation is fully serviced and up-to-date. Application Programming Interface. PROTECT is able to deliver the sufficient programming codes to succeed with an API solution. This way the control centers will be able to integrate the control of the fog cannon installations in its own user-interface.